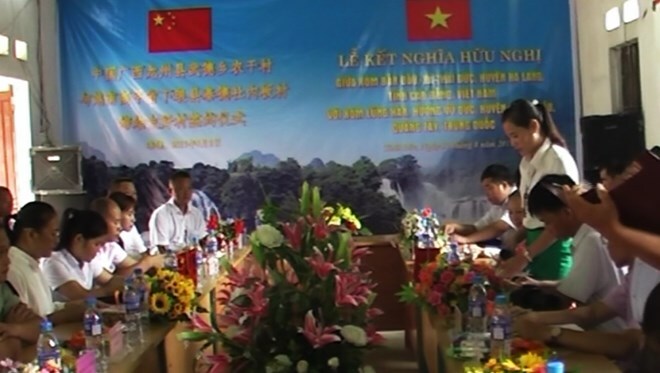 Cao Bang (VNA) – Ban Dau village, Ha Lang district in the northern province of Cao Bang and Long Han village, Long Zhou district in the Chinese province of Guangxi signed a Memorandum of Understanding (MoU) on forming a twin relationship on August 2. The move has raised the total pair of twinning localities between Cao Bang and border Chinese provinces to eight since 2015. Under the MoU, both sides will raise public awareness of traditional friendship between the two Parties, States and localities, enhance bilateral cultural and sport exchange and educate local people about abiding by three legal documents on Vietnam-China mainland border.